This fascinating hand colored 1809 map by Edinburgh cartographer John Pinkerton depicts Southern Africa. Covers Africa from Angola south to the Cape Colony (modern South Africa) and east to the Kingdom of Mongall (modern day Mozambique) and the island of Madagascar. Reflecting the somewhat limited knowledge of the African interior available to European cartographers of the period, only three areas are illustrated with any detail - the Congo, the Cape Colony (South Africa) and the former Kingdom of Monomotapa, which roughly overlaps modern day Mozambique. The Congo had been actively mapped and exploited by Portuguese merchants as early as the 14th century. South Africa, similarly, had an active Dutch and English presence since the earliest days of African Colonization. The ancient Kingdom of Monomotapa, here part of the Empire of the Bororos and divided into Sabia, Sofala, Munhay and Manica, appears on most early maps of Africa. Already a great trading Empire when Vasco de Gama rounded the Cape of Good hope in the 1490s, Monomotapa or the regions between the Sabia, Sofala and Zambezi River systems, had long been associated with legends of King Solomon's Mines and the Biblical lands of Ophir. In the 15th century the Zambezi hills were indeed rich in gold, but these deposits had run out by the 1600s. Still, the European imagination, inflamed by conquistador tales of golden empires in America, made several attempts to conquer the region, only to find that there was no more gold to be had. In other areas of Africa's interior Pinkerton notes an embryonic Lake Malawi (named Maravi), and notes several important African tribal nations, including the Massai, the Hottentots, the Bembe, and the Luba (Lubolo). Very good condition. Wide clean margins. Original centerfold. Blank on verso. 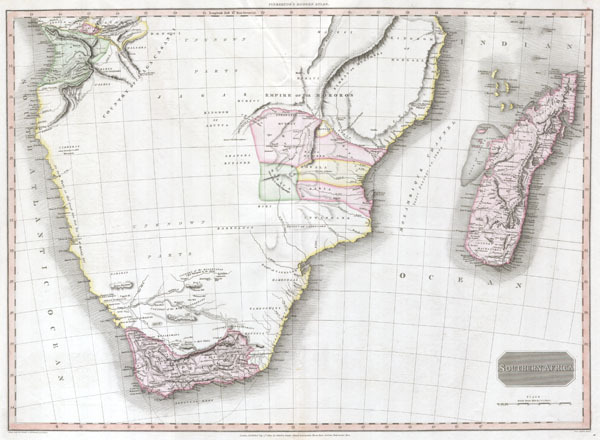 Tooley, R. V., Printed Maps of Southern Africa and its Parts, 230. Rumsey 0732.061. Phillips (Atlases) 724. National Maritime Museum, 409.